The most popular solar battery storage sold in Australia! Call us: Batteries are delivered to your door. Email BESS for an invoice. 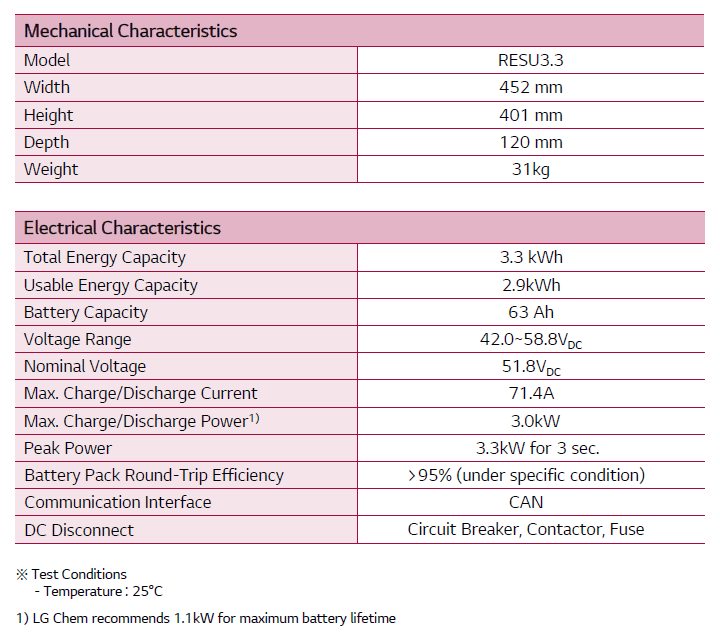 The new LG Chem RESU battery are smaller, more powerfull and cheaper than any other in the market. The RESUplus series is now available in Australia for immediate delivery. 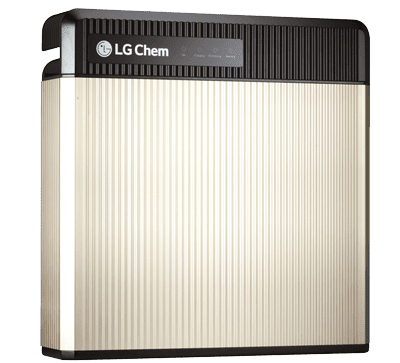 Be sure to do the homework, the LG Chem RESU 3.3 at $3420.00 offers great value. The state-of-the-art LG Chem RESU series is extremely efficient. Consider this - the RESU 6.5 kWh is very compact and weighs only 52kg. For a lead acid battery to match the RESU 6.5 in performance, it would be approximately 750kg of lead and to require 12kWh of storage. 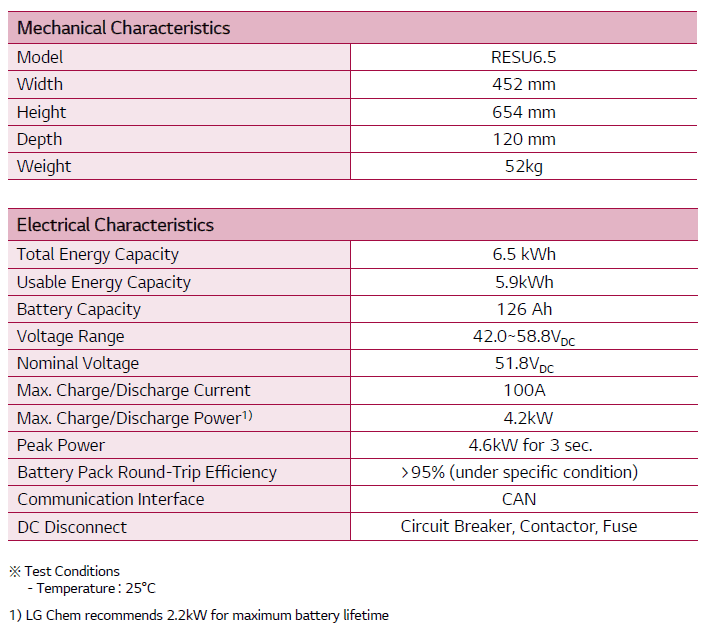 Battery Energy Storage Systems offers the best price for the LG Chem RESU in Australia. If you are looking for Blackout Free, the RESU battery is perfectly suited. The RESU 3.3 is the most affordable choice for blackout free capability for Australian households. Whether you are running a household or a business having power sercurity at all times with the LG RESU BESS battery will give you peace of mind and keeps your solar running while the power grid is down. The LG Chem RESU plus range includes the RESU 3.3, RESU 6.5 and RESU 10 and the high voltage range including the RESU 7H and RESU 10H. How long will it take to payback my battery? The payback period for battery storage can only be calculated against the size of the system you have, the amount of load you put the battery under and increase cost of power over time. This question requires some assumptions all based essentially on the future of electricity costs. Some speculate that power costs will continue to increase by between 5-6% per annum. From 2003-2013 they have increased 60% so approximately 5% per annum. Every household is different, have differing needs and are occupied by different lifestyles. The results that are available are encouraging and show significant savings. But who are these people. Who are the early adopters of the new era of battery storage? Are they the power hungry homeowners or the green minded? They are you and me. I great cross section of families from every spectrum, just as the solar has captured the imagination of the country so too has battery storage. Consumers who work from home, work away, live by themselves or have children, there is no real sign of any particular demographic who specifically want battery storage. What has been their motivation? Wanting to save on the power bill, adopt new technology, be the first. All great reasons and all helping in the long run to eliminate fossil fuel consumption. Even though there is still long Payback time it is still our belief that people who can afford a battery storage system will take it up. The hip pocket is only one reason that motivates the consumer. There is a real sense that Australian consumers do not trust energy companies where it comes to power/electricity prices and service. More consumers want more control of their power whether that is being totally self-sufficient or to have some ownership of their power. There is also the added environmental reasons why the consumer is choosing solar and solar with battery storage. The LG RESU3.3, 6.5 and 10 batteries offers you the greatest return for your money. Advanced Technology— The LG Chem RESU series has a lifespan of 15-20 years. Compact— At 600 x 400 x 170 (mm), power storage to size ratio is unrivaled. Flexible Installation— Available free-standing or wall-mounted. Expansion units—with RESUplus enables expansion up to 20kWh with two units. Inverter matched— Sungrow, SolaX, Redback, Goodwe, Ingeteam, Victron, SMA, Delta, Fronius. Sustainable— Reduce your reliability on the main grid while also reducing your carbon footprint. LG RESU 3.3 Price $3420.00 including GST and delivery. LG RESU 6.5 Price $5325.00 including GST and delivery. LG RESU 10 Price $6915.00 includes GST and delivery. Operating conditions for RESU 3.3, 6.5, 10 48v. LG RESU10H DLT Price $8120.00 includes GST and delivery. Where can I install the battery? 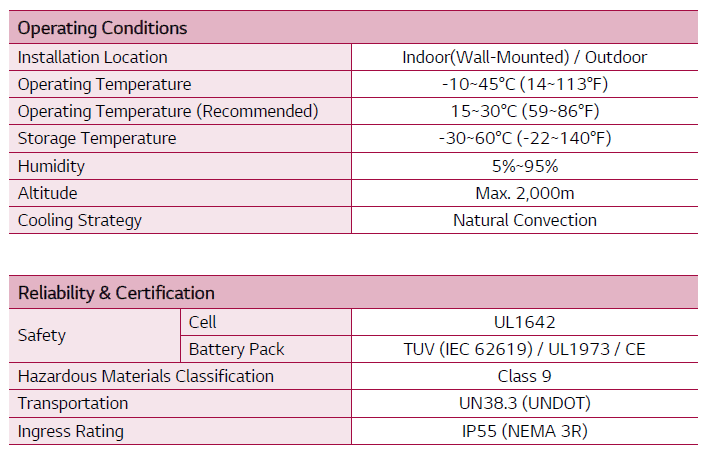 The RESU series are Enclosure Protection rated at IP 55. This means that it can withstand being sprayed by water and is protected from dust. The RESU requires no maintenance and has no moving parts. The battery makes no noise so it can be placed by windows without fear of disrupting people at home. Optimum operating temperature is between -10 to 45 degrees Celsius. Shut down will occur during severe heat. This is a very good feature knowing that the battery will protect itself from damage. Placing the battery indoors will improve the battery efficiency and its lifespan. 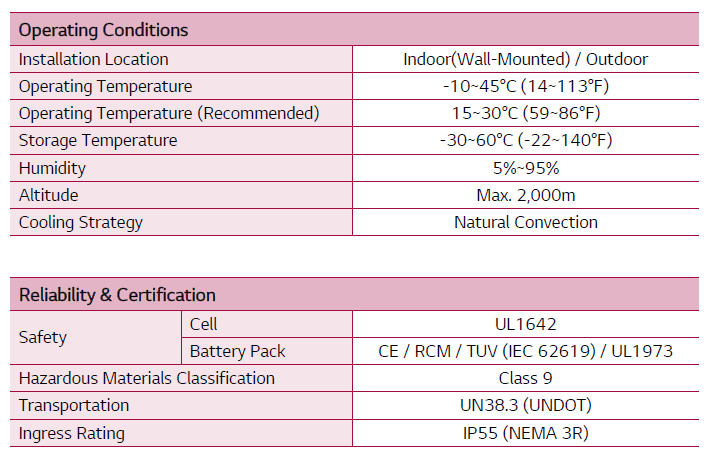 LG Chem claims to have the safest lithium-ion battery on the market but it is still a power storage system and thus should be treated with care. We strongly recommend that they are installed by accredited installers and away from flammable materials. 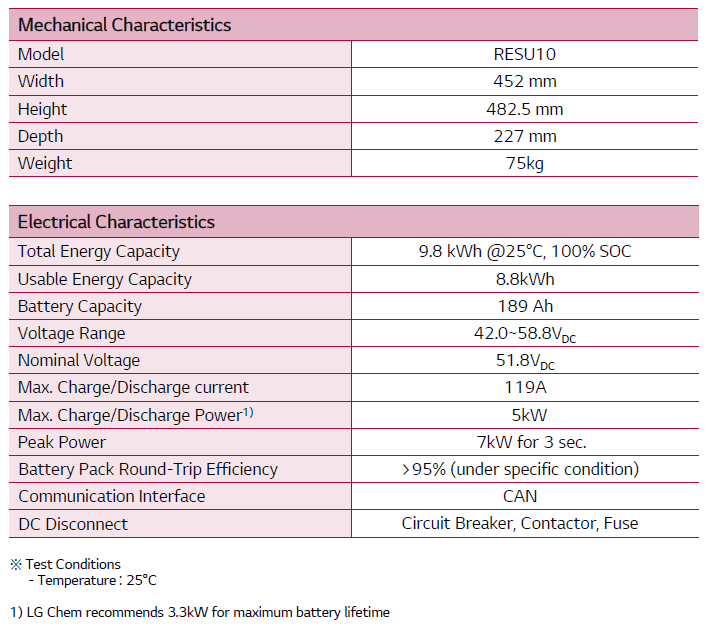 RESU batteries can be combined to give up to 17.6kWH of storage with two RESU 10. The battery size to power ratio is the greatest on the market by a long mark. LG Chem batteries are made with the most advance technology. Lithium-ion batteries are made as very thin fragile ribbons, so to make the ribbons into batteries, manufactures either roll or fold the ribbons. These methods either waste space or over time they distort. LG Chem use a method they call lamination and stacking. With this method the ribbon is cut and stacked, sheets are place on top of each other eliminating any dead space. 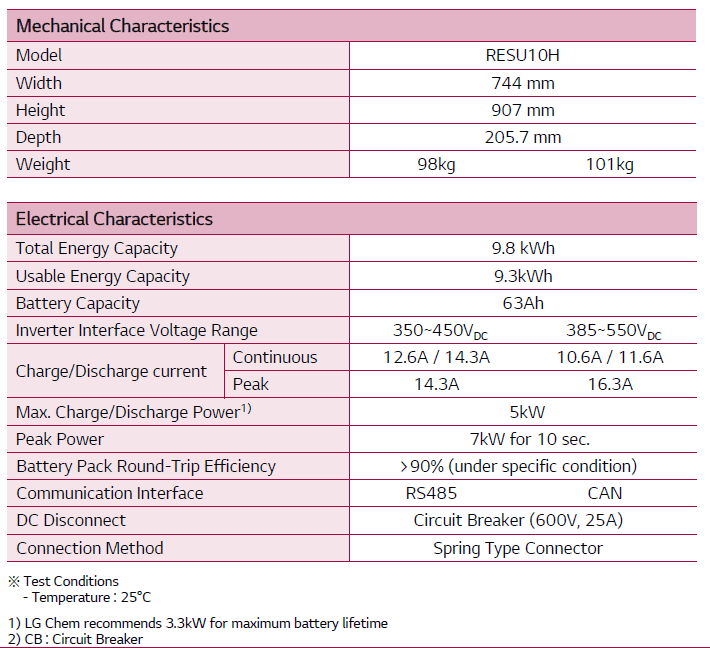 LG Chem-SMA combination All in One battery inverter energy storage to come. LG Chem have recieved the ees Award for 2016 for the RESU battery range. "Easy to install and space saving, RESU lends itself to external and internal assembly, as well as application in new and existing systems around the world. Capacity, energy density, long lifetime and safety- the panel of judges would like to celebrate the RESU range's pioneering features with the ees Award 2016." How much does the RESU 3.3 cost? Priced at $3420.00 the RESU3.3 battery is the smallest is the range and suitable for Blackout free. If the grid fails so does your solar unless you have a battery backup.Importantly your system will remain on and still provide you with solar energy to charge the battery. The middle sizes battery of the RESU range, the 6.5kWh is suitable for a two to three person home with modest power consumption. How much is the 6.5kWh? At $5325.00 this price will suit solar systems from between 3kW-6kW. How much is the RESU 10LV? For $6915.00 this battery offers the best return of storage for your money. The RESU 10H, high voltage battery is compatable with the SMA Sunny Boy Storage 2.5 and at $8120.00 or $9898.00 as a package is suitable for a high power consumption household or business.